Blahoš J., Svoboda Z., Höschl C.: The effect of calcitonine on glucose metabolism. Endokrinologie 68, 1976 , s.226-230. Höschl C., Stárka L., Roth Z., Vokálková J., Jaššová J.: A specific laboratory test for primary depression. Acta Univ. Carolinae Medica, 31, 1985, No. 5-6, str. 347-364. Řípová D., Němcová V., Farská I., Papežová H., Höschl C.: Changes in platelet phospholipid content in treated and untreated schizophrenics. Eur.Neuropsychopharmacol. 3 (3), 1993: 395. Kožený J. Höschl C.: The temperament and character inventory: psychometric integrity of the Czech version. Studia psychologica 41, 1999, 2:123-132. Řípová D., Strunecká A., Platilová V., Höschl C.: Phosphoinositide signalling system in platelets of schizophrenic patients and the effect of neuroleptic therapy. Prostaglandins, Leukotrienes and Essential Fatty Acids, 61, 1999, 2: 125-129. Höschl C.: Introduction (Editorial). In: Dose M., Höschl C. (editoři): Movement disorders in psychiatry, specifically to drug-induced dyskinesias. Pharmacopsychiatry 33, 2000, S1, str. 1 – 48. Thieme, Stuttgart – New York 2000. ISSN 0936-9589. Höschl C., Hájek T.: Hippocampal damage mediated by corticosteroids – a neuro­psychiatric research challenge. Eur. Arch. Psychiatry Clin Neurosci 2001, 251:Supp.2,II/81-II/88. Kopeček M., Höschl C., Hájek T. Regional selectivity of novel antipsychotics. Br. J. Psychiatr. -181, 2002, 9:254-255. Grunze H, Kasper S, Goodwin G, Bowden Ch, Baldwin D, Licht RW, Vieta E, Möller HJ, WFSBP Task force on Treatment Guidelines for Bipolar Disorders (C. Höschl, member of task force): The World Federation of Societies of Biological Psychiatry (WFSBP) Guidelines for Biological Treatment of Bipolar Disorders, Part II: Treatment of Mania. World J Biol Psychiatry, 4;2003, 5:5-13. Horáček J., Bubeníková V., Kopeček M., Brunovský M., Páleníček T., Höschl C.: From animal models to clinical treatment modalities in schizophrenia. Eur. Neuropsychopharma­cology, 13, 2003, Suppl. 4:S158. Horáček J., Kopeček M., Španiel F., Mohr P., Dockery C., Seifertová D., Bělohlávek O. Höschl C.: Resting regional brain metabolism in patients with schizophrenia. 18FDG PET study. (Klidový regionální metabolizmus mozku u pacientů se schizofrenií. Studie 18FDG PET). Psychiatrie, 8, 2004, S3:43-50. Bubeníková V., Horáček J., Kožený J., Platilová V., Závěšická V., Höschl C.: The effect of tryptophan depletion on the action of haloperidol in MK-801 treated rats. European Journal of Pharmacology, 2004, Vol. 502; 1-2:109-116. Horáček J., Závěšická L., Tintěra J., Dockery C., Platilová V., Kopeček M., Španiel F., Bubeníková V., Höschl C. The effect of tryptophan depletion on brain activation measured by fMRI during the Stroop test in healthy subjects. Physiological Research 2005, vol. 54:235-244. Škrdlantová L., Horáček J., Dockery C., Lukavský J., Kopeček M., Preiss M., Novák T., Höschl C. The influence of low-frequency prefrontal rTMS on memory for words but not faces. Physiological Research 2005; 54, 1:123-128. Horáček J., Bubeníková-Valešová V., Kopeček M., Páleníček T., Dockery C., Mohr P., Höschl C.: Mechanism of action of atypical antipsychotic drugs and the neurobiology of schizophrenia. CNS Drugs. 20, 2006; 5:389-409. Kopeček M., Brunovský M., Novák T., Tišlerová B., Horáček J., Höschl C.: The effect of cerebellar repetitive transcranial magnetic stimulation on electrical brain acitivity detected by low resolution electromagnetic tomography (efekt mozečkové rTMS na elektrickou aktivitu mozku detekovanou nízko-rozlišovací elektromagnetickou tomografií). Psychiatrie, 10, 2006;S3:54-58. Praško J, Dockery C, Horáček J, Houbová P, Kosová J, Klaschka J, Pašková B, Prašková H, Seifertová D, Záleský R, Höschl C. Moclobemide and cognitive behavioral therapy in the treatment of social phobia. Neuroendocrinology Lett. 27, 2006;4:473-481. Horáček J, Dockery C, Kopeček M, Španiel F, Novák T, Tišlerová B, Klírová M, Páleníček T, Höschl C.: Regional brain metabolism as the predictor of performance on the Trail Making Test in schizoprenia. A 18FDG PET covariation study. Neuroendocrinology Letters 27; 2006, 5:587-594. 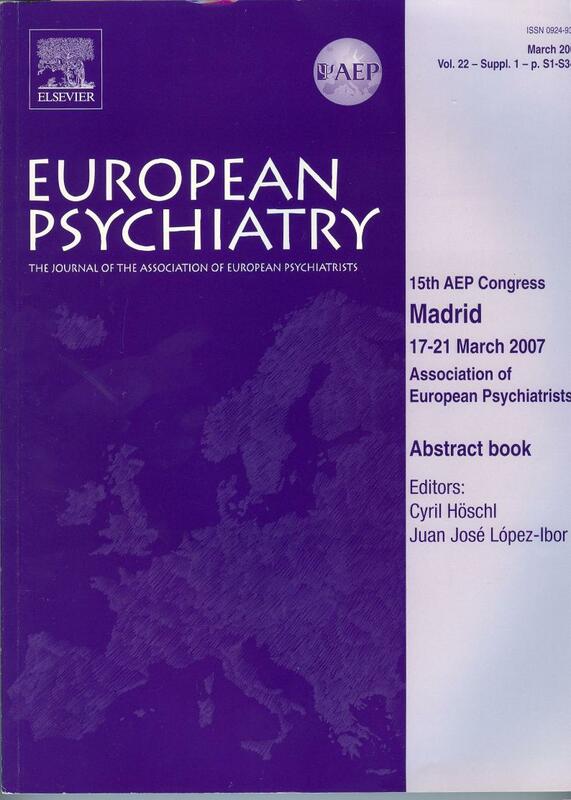 Höschl C., Lopez-Ibor JJL (editors): Proceedings of 15th European Congress in Psychiatry. European psychiatry, 22, 2007, Suppl.1, p. S1-S342. Motlová L, Španiel F, Höschl C, Balon R. Are There Any Differences in the Efficacy among Second Generation Antipsychotics in the Treatment of Schizophrenia and Related Disorders? Ann Clin Psychiatry. 2007 Apr-Jun;19(2):133-43. Spaniel F, Tintera J, Hajek T, Horacek J, Dezortova M, Hajek M, Dockery C, Kozeny J, Höschl C.Language lateralization in monozygotic twins discordant and concordant for schizophrenia. A functional MRI pilot study. Eur Psychiatry. 22, 2007; 5:319-322. Španiel F, Novák T, Motlová L, Hrdlička J, Höschl C: Information Technology Aided Relapse Prevention Program in Schizophrenia (ITAREPS): reliability and validity of the early warning signs questionnaire. (Informačními technologiemi podporovaný program prevence relapsu schizofrenie /ITAREPS/: reliabilita a validita dotazníku časných varovných příznaků). Psychiatrie, 11, 2007; 3:157-159. Bubeníková-Valešová V, Horáček J, Vrajová M, Höschl C. Models of schizophrenia in humans and animals based on inhibition of NMDA receptors, Neurosci. Biobehav. Rev.2008, 32:1014-1023. Závěšická L., Brunovský M., Horáček J., Matoušek M., Šóš P., Krajča V., Höschl C.Trazodone improves the results of cognitive behavioural therapy of primary insomnia in non-depressed patients. Neuroendocrinology Letters 2008; 29:6. Bares M, Kopecek M, Novak T, Stopkova P, Sos P, Kozeny J, Brunovsky M, Höschl C: Low frequency (1-Hz), right prefrontal repetitive transcranial magnetic stimulation (rTMS) compared with venlafaxine ER in the treatment of resistant depression: A double-blind, single-centre, randomized study. J. Affect. Disord. 118; 2009, 1-3: 94-100. Kopřivová J, Horáček J, Tintěra J, Praško J, Raszka M, Ibrahim I, Höschl C. Medial frontal and dorsal cortical morphometric abnormalities are related to obsessive-compulsive disorder. Neurosci Lett. 464; 2009, 1:62-66. Bares M, Brunovsky M, Novak T, Kopecek M, Stopkova P, Sos P, Krajca V, Höschl C. The change of prefrontal QEEG theta cordance as a predictor of response to bupropion treatment in patients who had failed to respond to previous antidepressant treatments. Eur Neuropsychopharmacol. (2010) 20: 459–466. 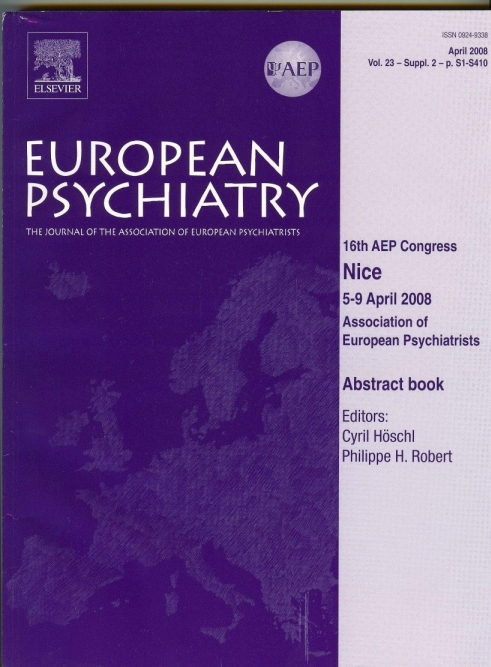 Möller HJ, Bitter I, Bobes J, Fountoulakis K, Höschl C, Kasper S. Position statement of the European Psychiatric Association (EPA) on the value of antidepressants in the treatment of unipolar depression. Eur Psychiatry, 2012 Feb;27(2):114-28. Hajek T, Kopecek M, Alda M, Uher R, Höschl C. Why negative meta-analyses may be false? Eur Neuropsychopharmacol. (2013) 23, 1307–1309. Stein DJ, Ahokas A, Márquez MS, Höschl C, Oh KS, Jarema M, Avedisova AS, Albarran C, Olivier V. Agomelatine in generalized anxiety disorder: an active comparator and placebo-controlled study. J Clin Psychiatry. 2014 Apr;75(4):362-368. ISSN 0160-6689. Fountoulakis KN, Kawohl W, Theodorakis PN, Kerkhof AJFM, Navickas A, Höschl C, et al. Relationship of suicide rates to economic variables in Europe: 2000-2011. BJPsych, 2014, 205(6), 486-496. ISSN 0007-1250.